St. Patrick’s Day is almost here! I’m so excited that this is the first year Corban is old enough to understand holidays and be excited about them. I’ve been practicing all sorts of cute green snacks on him, and this one is his new favorite because it contains three of his favorite foods: Kiwi, grapes, and pear. Healthy. It’s nothing but fruit. Cute. 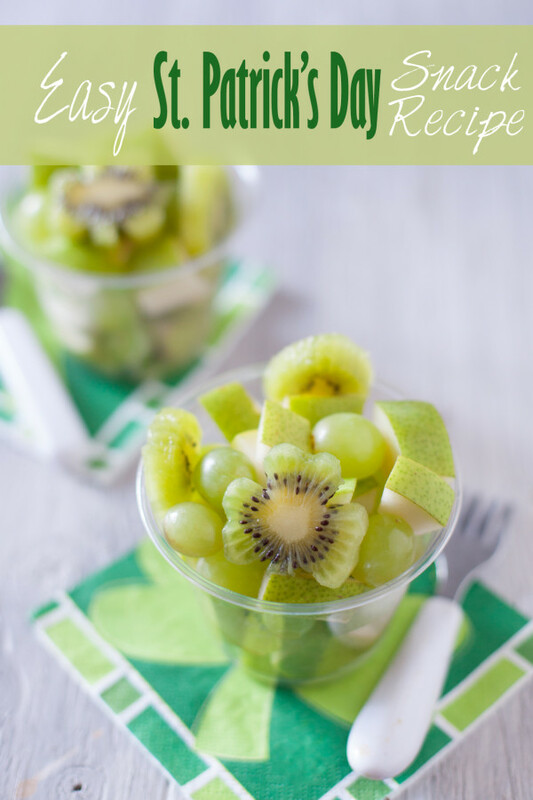 The all green fruit topped with a kiwi shamrock is a fun way to celebrate St. Patrick’s Day at snack time. Irresistible. 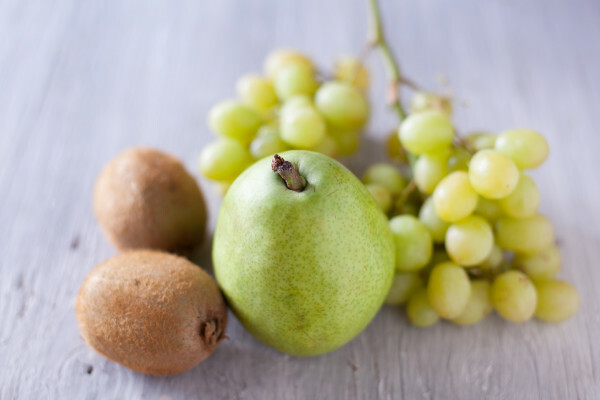 Kids love kiwi, grapes, and pear, and rarely pass up finger food. I love that this snack is so easy to make. Seriously. I just have to chop a pear, rinse off some grapes, and peel and slice a kiwi. 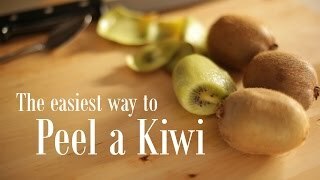 If you missed it in last week’s kiwi turtle post, here’s my video showing Corban how to peel a kiwi. I can peel five in under a minute this way. I am seriously a kiwi peeling pro! You can easily prep this for a large group of kids, whether you’ve got a bunch of your own, or are in charge of snack for a preschool full of ravenous kiddos. The prep is just some rinsing and chopping, but serving it in the clear plastic cup makes it look really cute and appetizing. It’s also incredibly convenient. I tried it out on a larger group last week, and it was just as popular with the parents as it was with the kids! For ingredients, you’ll need about one kiwi per cup, one pear for every four cups, and one bunch of grapes for every 9 cups. You can kind of fudge the numbers. So if you’re serving a crowd of 10, no need to buy an extra pear and bunch of grapes for one or two more servings. The recipe below is for 4 servings, but you could absolutely make just one serving for your own little munchkin and have some leftover pear and grapes to snack on for yourself. You’ll also need clear plastic cups, a paring knife (and a spoon for peeling the kiwi), and a small shamrock cookie cutter. I used the smallest cookie cutter in the Amazon set below. I’m loving how cutting food into a shamrock shape is so easy and cute. I’ve been trying it on all sorts of foods. Next up I think I’ll try potatoes. I’m addicted to cookie cutters! Oh, and if you like this cute kid’s snack, you’ll love our freebie of 5 Cute, Quick and Healthy Snacks for Kids. Just click the image below to grab your copy. 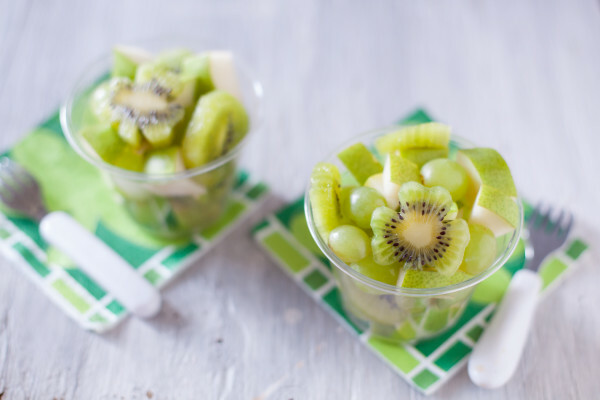 This simple fruit salad uses green kiwi, pear, and grapes. Perfect for a cute St. Patrick's Day kid snack! Peel the kiwis and slice into rounds. Use a small shamrock cookie cutter to cut a shamrock shape out of the four largest kiwi rounds. Cut the pear into chunks. Divide fruit among four clear plastic cups, reserving the shamrock shaped kiwi slices. Top each cup of fruit with a shamrock kiwi. 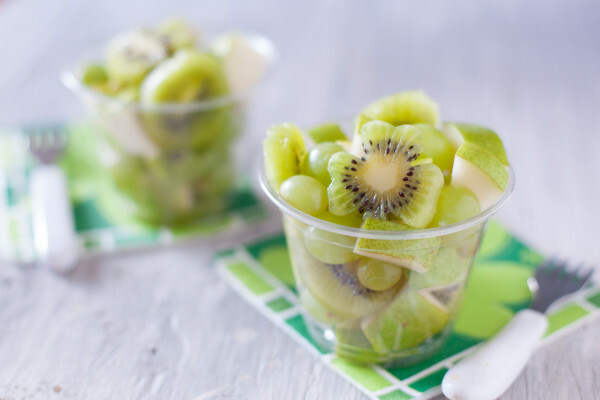 How smart to use grapes and kiwis! Love it!